The LGBT Community Fund of Southwest Florida, a fund of the Southwest Florida Community Foundation, is a giving circle that engages like-minded individuals and organizations to increase philanthropic support in Southwest Florida for the unique challenges and opportunities facing the region’s LGBT community. You can simply give a contribution, honor or memorial gift, or become a Contributor. For information on creating a Legacy Fund as part of your estate plan to benefit the LGBT Fund in perpetuity, please contact us by email here. 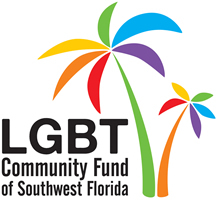 The LGBT Community Fund is a fund of the Southwest Florida Community Foundation. © 2019 LGBT SWFL. All Rights Reserved.